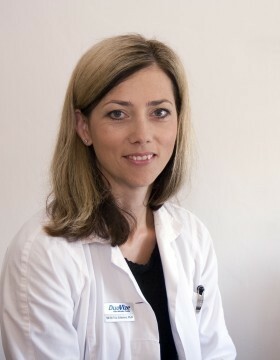 Eye doctor Eva Jerhotová, M.D., Ph.D.
Dr. Eva Jerhotová focuses primarily on the treatment of diseases of the retina and glaucoma, examinations with the help of OCT, treatment of refractive errors, children's ophthalmology, treatment of strabismus and general eye problems. 1998 - 2006: private Eye clinic JL in Nové Butovice - focused on diseases of the posterior segment of the eye, especially patients with an age related macular degeneration and a diabetic retinopathy. At this clinic, she was the first one in the Czech Republic to perform the examination of the retina with the help of OCT (optic coherent tomography). 2000: received the academic title Ph.D.
Dr. Jerhotová is a co-author of multiple professional lectures and articles. She is a member of the Czech ophthalmologic association and the Czech Doctors' Chamber. She regularly attends professional ophthalmologic congresses and seminars.